DISH NetworkCorporation today announced that its subsidiary, Blockbuster L.L.C., will end its retail and by mail DVD distribution operations by early-January 2014. The company will close its approximately 300 remaining U.S.-based retail stores, as well as its distribution centers. I had a cat once. His name was Rascal (affectionately known as Manny by his closest friends), and he was a great cat in his prime. Fun to be around, energetic; he even used to run around outside and catch mice and birds out of thin air. As Rascal got older, he mellowed out. He was still a good cat, but it was clear his golden cat years were behind him. As he got into his mid to late teen years, Rascal got various ailments, including a kidney diesease that caused him to go partially blind. One day we took him to the vet, and they prescribed him kidney medication which miraculously cured his blindness. Rascall eventually passed, but he waa the most resilient cat I’ve ever been around. Blockbuster is Rascal the cat. I could’ve swore they closed down every store 10 years ago. Apparently they had a Blockbuster by mail service? Who the hell knew. Nothing like sending out a few advertisements letting people know. I hope this is the final nail in the coffin, just like Rascals kidney disease and subsequent blindness. You never want to see something that was once so great have to live a life on it’s knees. It’s like watching Jordan play for the Wizards. 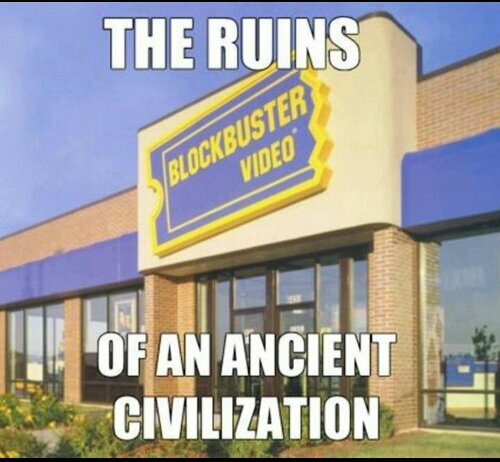 Let’s hope Blockbuster goes out gracefully. Posted on November 6, 2013, in Average Blog Posts and tagged blockbuster, closing, DISH, dvd, network. Bookmark the permalink. Leave a comment.